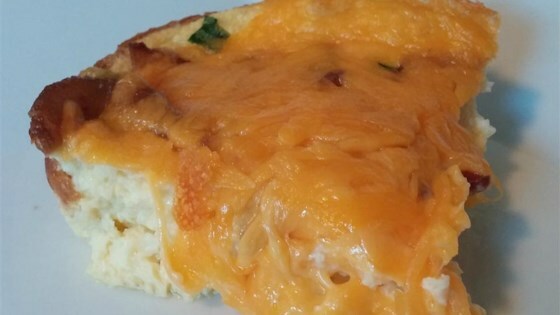 "This is an easy but good breakfast casserole. The cheese and bacon give it a lovely flavor." Spray a 9-inch square baking dish with cooking spray. Place bread slices in a single layer in the bottom of the prepared baking dish. Whisk milk, egg substitute, and chives together in a bowl; pour over bread slices into prepared baking dish. Sprinkle bacon crumbles over the top. Cover the dish with plastic wrap and refrigerate, 8 hours to overnight. Remove and discard plastic wrap from baking dish; let dish come to room temperature, about 30 minutes. Bake casserole in the preheated oven for 40 minutes. Sprinkle cheese over the top and continue baking until cheese is melted and casserole is set, about 5 minutes more. I used green onions instead of chives and added salt and pepper. This was a very good cheesy meal! Would make again and I love that it only makes a small casserole size!